Dubai Festivals and Retails Establishment (DFRE), an agency of Dubai Tourism and Commerce Marketing (DTCM), have announced the Dubai Food Festival 2015’s full and flavoursome line-up of new and returning gastronomic consumer and business events, celebrity chefs, activities and promotions. Marking the Festival’s second edition, this year’s Dubai Food Festival (DFF) will welcome a bursting calendar of delicious and diverse events across four key themes, including Emirati Cuisine, Homegrown restaurants, Multi-cultural Dining and Street Food and International Chefs and Restaurants. With exclusive and new events set to include the region’s first foodie film nights, Dubai Food & Film, and nine back-to-back celebrity chef cooking sensations as part of the new-for-2015 and Middle East’s first, Fatafeat Kitchen, the Festival will also welcome a fleet of the city’s favourite food trucks in the Food Truck Convoy. Another highlight comes in the form of celebrity chef’s taking over the kitchens of the Dubai Creek’s iconic floating restaurants as part of Dine On The Creek. The 23-day citywide extravaganza will also bring back 2014 event favourites, Beach Canteen, Dubai Food Carnival, Taste of Peru, GulFood and the Global Restaurant Investment Forum (GRIF) amongst many more, to satisfy the culinary cravings of Dubai’s visiting and resident foodies. DFF 2015 headliners include the Michelin-starred Jason Atherton, award-winning Greg Malouf, TV favourite Sanjeev Kapoor, Queen of the Arabic Kitchen, Manal Al Alem, critically acclaimed chef and best-selling author, Silvena Rowe, and the renowned Saudi Arabian Super Chef Yousef Khumayes, many of whom have restaurants in the Emirate. Her Excellency Laila Mohammed Suhail Chief Executive Officer, Dubai Festivals and Retail Establishment, said: “This year’s edition of the Dubai Food Festival will incorporate a varied and extensive events calendar, showcasing our Emirate at its culinary best. Along with welcoming a number of internationally-renowned chefs, including those who have established restaurants in Dubai, the Festival will celebrate another key element of Dubai’s gastronomic offering, its most-loved home-grown concepts. 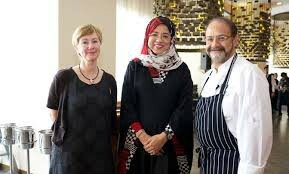 “The Festival programme has been designed to both highlight the range of flavours that inspire Dubai’s menus, drawn from the cuisines of the 200 nationalities that live in the city, as well as the traditions of Emirati cuisine and hospitality, an increasingly important element of our tourism offer. We look forward to welcoming residents and visitors from the region and beyond throughout February to experience the depth and diversity of our city’s culinary credentials,” continued H.E Laila Suhail. The Dubai Food Festival is a 23-day programme of food-related consumer and trade events, activities, promotions and appearances by food celebrities. The Festival promotes the diversity, creativity and multicultural nature of Dubai’s culinary offering – from five-star gourmet dining to everyday restaurants and cafés for all budgets; international brands to a burgeoning scene of home-grown concepts influenced by traditional Emirati cuisine and the flavours of the 200 nationalities that live in Dubai. For more information on the Festival you can visit the website or follow the food festival on Facebook, Twitter and/or Instagram.